What were you created to become? I wonder if the humble little caterpillar ever stops to remind itself that it’s already destined to become one of nature’s most exquisite creations. It is on a transformative course that will see it grow colorful wings, no longer will it be earth bound but the gift of flight will be its daily experience. I wonder if we have any inkling of what WE were created to become? If you really knew who you were, you’d never feel inferior again. You are becoming the person you were meant to be. Believe it, then trust the process. Thank you for your beautiful work. You always capture the warm and loving nature that IS Jesus. You are truely blessed. Thank you, Brother Olsen. I needed to hear that right now. My husband of 35 years just had his third stroke, which the doctors said he wouldn’t survive. He isn’t the man I married in the Idaho Falls temple in December of 1979. He has anger issues now, and can make it hard for me to do the daily care taking. I’ve seemed to have lost myself through this journey and lose the fact that I am a cherished daughter of God. Thank you for sharing your testimony both with your art work and your words. I have daughters who are artists, one who is exceptionally gifted. She is my youngest at 18. I hope some day she will bless others with her art work the way that you have. Bless you. Sister Candace Raborn, I can understand some of what you are going thru. My mother had a major stroke at the age of 53 that left her paralyzed on her left side, she had many strokes after that plus lots of other health issues. All of these health issues created many problems. One day it came to mean (I’m sure thru divine deliverance) that if I treated my mother as “a sweet little old lady” something I would have no problem doing for another woman I could manage her better. It was like putting a distance between her being my hurtful mother that said horrible things to me, things I wouldn’t say to my worst enemies and now making her just another person – like a neighbor down the street. It worked! I was able to smile at her and not take all those things personal. Please try this I promise it works believe me my mother wasn’t a sweet little old lady most of the time. When people we love turn mean it really hurts I know but this process works and I call it a process but you will need to remind yourself about it over and over for a while. I send you lots of love and a big hug. It’s a beautiful reminder of God’s belief in our potential. 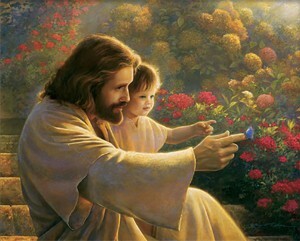 I love this painting of the Savior Jesus Christ with this precious daughter of God and the butterfly. I love all of the paintings by Greg Olsen he makes them look so soft and touching with the spirit. Thank you Greg Olsen for your awesome inspirational art talent. Brother Olsen, you have inspired me through some of the deepest trials throughout my life. I just want to say thank you for sharing your gift. It truly is such a beautiful treasure. I love this piece- after years of not being able to have children and losing a pregnancy, I cross-stitched this piece on bedrest through a horribly scary pregnancy praying that everything would somehow be ok. She is now six years old and starts first grade on Monday 🙂 …just one of the MANY pieces you have done that has a special story in my life that goes along with it. THANK YOU!!! !